We know that security is one of your top concerns as a Google Apps admin and that many of you require your employees to turn on 2-Step Verification (2SV) to keep their accounts safe. There are multiple ways your end users can approve sign-in requests via 2SV—by tapping a Security Key, by entering a verification code sent to their phone or, starting today, by approving a prompt like the one below that will pop up on their phone. 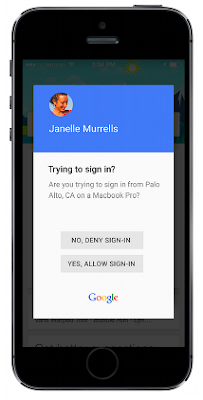 Your employees can now choose any of these options in the Sign-in & Security > Signing in to Google > 2-Step Verification section of My Account. The Help Center will be updated with detailed instructions soon; check back here for links to the relevant articles.